You guys. Thanksgiving is next week. Can you believe it? With that comes the busiest travel day of the year. 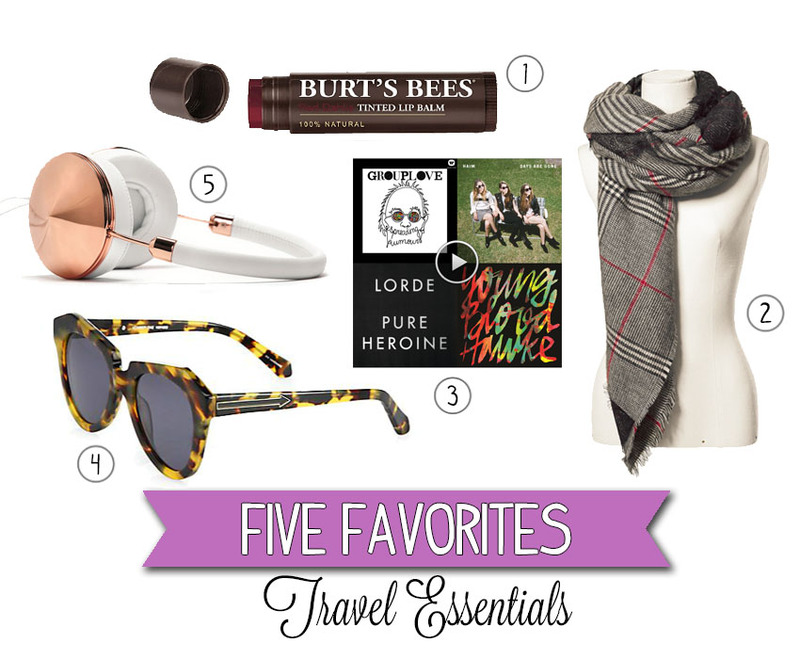 With that event on the horizon, I found it a perfect time to share my top 5 travel essentials. I don't know about you but leaving my natural climate for a new destination always messes with hydration level. The first place I feel the effects? My lips. I can never travel with out at least one several lip balms. You can never predict what the weather is like while you're on the move. Having a big, soft scarf is the key to being prepared for whatever your adventures throw your way. A thick, square scarf can be wrapped around your neck but can double as a shawl or even a throw if you really want to wrap yourself up. Nothing can pass the time quite like an amazing line-up of your favorite tunes. Whether you're road tripping or just trying to drown out the noise on a plane, you have to have a list of songs ready to go. My eyes are super sensitive to light so I'm always prepared with a pair of shades or two in my travel bag. They're super handy if you fall asleep and need to cover up puffy, tired eyes. I always have a good pair of headphone and/or earbuds when I travel. Not only are you going to need them to listen to the music from #3, but they're the best defense against annoying and loud travel companions. Your turn--what are your travel essentials? I totally agree! Love me some rose gold!